Salads are ideal for summer, especially when produce is nearing its peak. But sometimes, what you really want is meat. Here, seven hearty salads with a high meat-to-vegetable ratio. For an easy meal, toss shredded chicken with everything you would put on an antipasto plate, like roasted peppers, soppressata and fresh mozzarella. 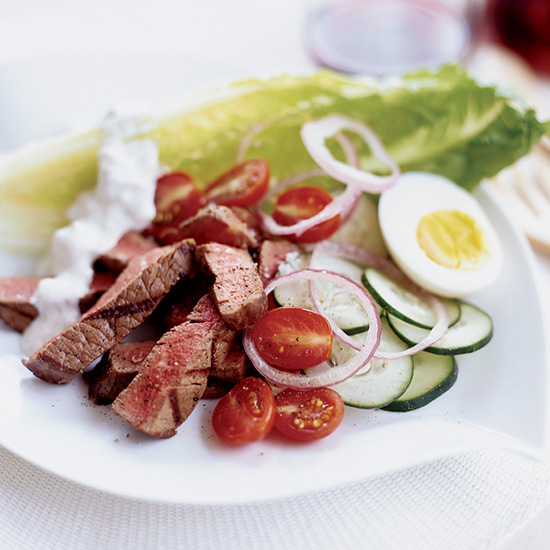 This super-filling chef’s salad is packed with grilled beef tenderloin, hard-cooked eggs and vegetables. There’s not much more to this salad than ground meat spiked with chiles, lime juice and fish sauce. Instead of tossing the meat with lettuce, the lettuce is used to wrap the delicious meat. This is the best way to eat sausage and feel great about it afterward. Creamy and tangy, this salad is like a super-meaty take on a classic Waldorf salad. Like a steak sandwich in salad form, this dish tosses grilled steak with homemade grilled croutons, avocado, radishes and escarole.